Thinly sliced, flash-fried okra is served alongside sandwiches and wraps as an alternative to French fries. Chai Pani also serves kale pakoras (see below), but they are thicker with more “breading” than typical kale chips. Fresh kale is flash-fried in a curried chickpea batter and served up with green chutney and sweet yogurt. The curried batter is so thick and crunchy, the kale is almost an afterthought. 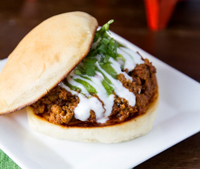 A traditional Indian sandwich known as Kheema Pav, the sloppy Jai features spicy lamb simmered with tomatoes, ginger and aromatic spices and served with onions, cilantro, green chutney and sweet yogurt served on a toasted bun. Get ready for a mess! For a vegetarian take, try the pav bhaji Gokul Sweets in Decatur, which stars a vegetable curry on breads that resemble miniature hamburger buns. Similar to a pancake, this South Indian specialty is made from rice and lentil batter served with a variety of toppings and sambar, a spicy, tangy vegetable stew. At Chai Pani, uttapam come with a choice of carrots, peas, onion, cilantro, ginger, and chilies, or tomato, Amul cheese, onion, cilantro, ginger, and chilies. This traditional Indian drink includes chilled yogurt, sweet mango pulp, and cardamom. Though vada pav is vegetarian and does not taste like a hot dog, it is India’s cultural equivalent. The dish is comprised of spicy potato dumplings fried in curried chickpea batter, topped with green and tamarind chutneys, and served on toasted buns. They’re served every street corner—just like hot dogs are in New York. Designed to be eaten in one bite (for fear of creating a mess), this dish is made up of savory puffed flour crisps (puris) stuffed with potatoes, onions, cilantro, and crunchy chickpea noodles, and topped with sweet yogurt, tamarind and green chutneys. A fried pastry shell is stuffed with spicy cumin-scented potatoes and topped with tamarind and green chutneys. This Indian rice pudding is made with coconut milk, raisins, and nuts. It’s meant as a dessert or comfort food.